Several well-wishers comprised of friends, business colleagues and doctors gathered at the posh Grand Ballroom of Marco Polo Hotel Cebu for the University of Cebu Medical Center Inaugural Dinner. The crowd surprised the hosts who were only but grateful that despite the heavy flooding and traffic congestion that day, guests came to show support. Which was only fitting, since the night turned out to be a double affair, as UC colleagues surprised their Chancellor Ms. Candice Gotianuy, who was then celebrating her birthday, with a cake. Exciting dance and song numbers continually entertained the guests including performances from the UC Chorale, UC Dance Company and Fire Attraction Dancers. The University of Cebu is sourcing an initial investment of PhP 2 Billion to build the University of Cebu Medical Center (UCMC), a Level 4 General Hospital to be located at the North Reclamation Area, Subangdaku, Mandaue City, Cebu. 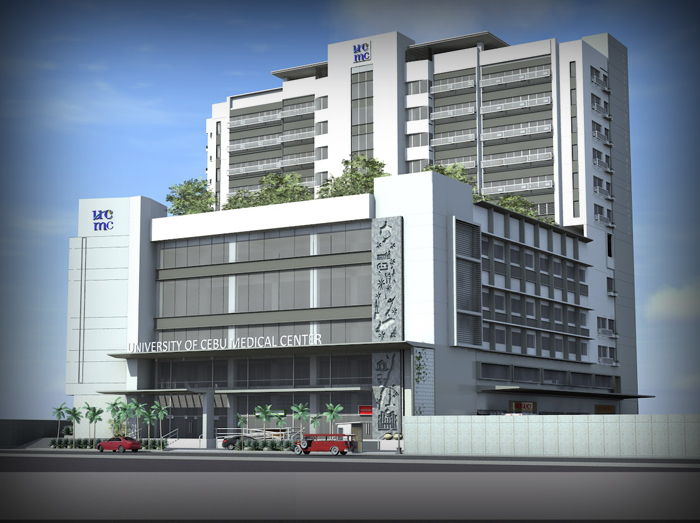 As the first Level 4 Hospital in Mandaue City, the University of Cebu Medical Center will be 12 stories high across an 8,000 square meter property or land owned by University of Cebu of roughly 1.3 hectares. Its floor area will be close to 30,000 square meters with a massive entrance lobby, Emergency Room, Radiology Section with X-Ray, MRI and reception, doctors clinics, the Intensive Care Unit, Dialysis Center, operating rooms, admitting area, chapel, conference rooms, wards, private rooms and suite rooms designed by architectural firm Espina, Perez-Espina & Associates led by Archt. Maxwell Espina. Expected to be fully operational within 18 months, UCMC will serve the general public and the population of all the UC schools and campuses, including the 10,000 plus merchant marine students who will need medical accreditation and attention for foreign ship deployment and the medical and nursing students for their training and employment, plus the rest of the 39,000 students for their medical needs. The University of Cebu has offered quality yet affordable education for over 44 years to residents of Cebu and the regions of Visayas and Mindanao. With a total student population of more than 44,000 students, UC is the biggest educational institution in the Philippines congregated in only one area. UC has four campuses functioning as one – the University of Cebu Main Campus along Sanciangko St. Cebu City, the University of Cebu Banilad Campus in Banilad, Cebu City. the University of Cebu Lapulapu and Mandaue Campus in Mandaue City, and the University of Cebu Maritime Education and Training Center in Mambaling, Cebu. Now with the UC Medical Center the commitment towards providing quality but affordable education and medical care will be elevated towards greater heights as UCMC will allocate a percentage of its of its services for less privileged members of Cebu at charitable prices.